Published on July 27, 2010 in Actions and Summer 2010. Closed Tags: greece, swarming greece 2010, w2eu. 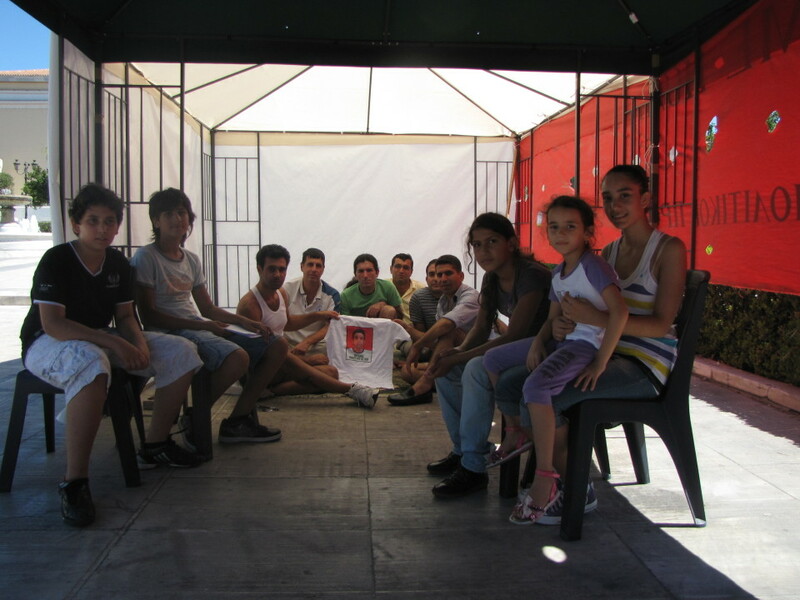 Last year a noborder camp took place in Lesvos, one of the main arrival islands in the Aegean Sea. The pictures of the totally overcrowded island prison Pagani and the deeply inhuman internment practices have not been forgotten. However, the revolts and campaigns that led to the closing of Pagani prison, were just as impressive, and in many refugee camps in the whole of Europe the stories of ‘noborder’ is still being told. Europe is intervening. As if to quickly patch the situation, Frontex, the European border agency is involved in establishing a system of selection and deportation, which is equivalent to European ‘standards’. ‘Screening centres’ will be the new name for the detention centres in Greece. They target what has been possible despite all the repression and chaos in Greece: freedom of movement, the ability to continue the journey to the countries in the centre of Europe. From the 27th of August to the 11th of September 2010, the Network Welcome to Europe will once again travel to Greece. Join us, come along, be part of it, or simply follow our activities and findings in this blog. If you want to know more, read all details of the Swarming Noborder Greece 2010. Published on November 13, 2009 in Athens. 3 Comments Tags: After Pagani, fates, greece, repression. Published on November 12, 2009 in Insight and Lesvos. Closed Tags: greece. We are reporting on this blog since several month about the no border actions and the situation for refugees and migrants on the island of Lesvos. There is a blog written by under-age refugees on their way to Europe. It is a good opportunity to read about this topic written in a different perspective, the on from the refuges themselves. 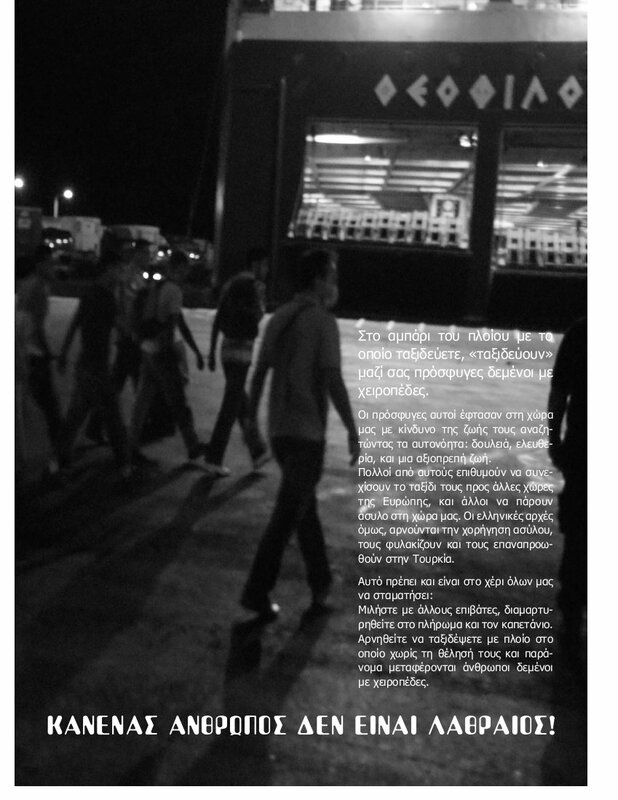 Published on August 11, 2009 in Lesvos and Run Up. Closed Tags: greece, strategy of fear, thieves. According to secure information, law enforcement authorities have identified and blocked quantity of printed material of anarchists for the event no border camp, which arrived by ship in the harbor. Impression is caused by the fact that the material, which identified by the authorities, was hidden in packages that were sent from Athens (by people who work until recently as a body of government on refugees) and intended as a “humanitarian assistance for refugees”! The material unloaded from the ship with the assistance of Coast Guard men, but upon unloading one package was opened, so to determine its content. It is obvious that there is a trial to create atmosphere against the no border camp and the authorities are ready to use all methods. The fact that newspapers like “empros” are carrying false reports disseminated on porpose by the authorities,is expected. The material for the no border camp that will take place from 25 to 31 August in Mitilini was sharing already in various towns and villages of the island. No one is illegal. Come to discuss in the squares of the island. Published on August 9, 2009 in Lesvos, noborder lesvos '09 and Run Up. Closed Tags: direct action, greece, stupidity. Somewhere on the way out of Mytilini, fascists wrote “Turks. refugees, anarchists. 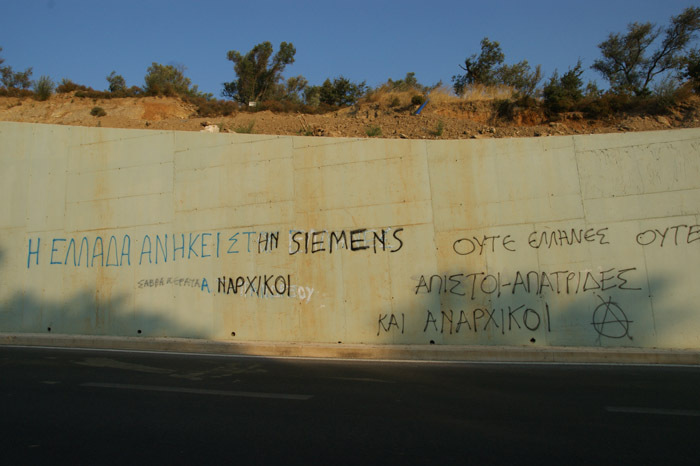 Greece belongs to the Greek.” And then some hours later, it said “Greece belongs to Siemens”.